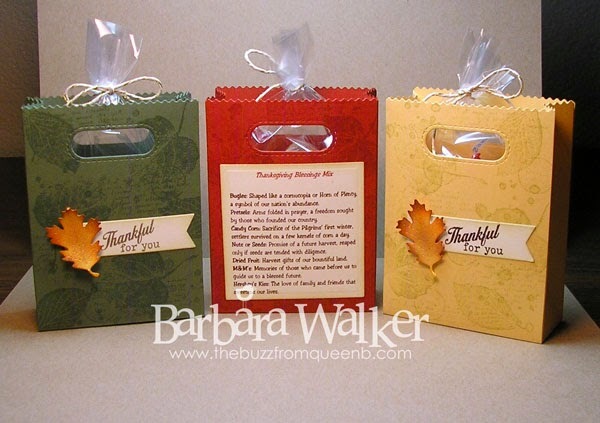 I selected several Autumn toned card stocks and die cut them with the Lawn Fawn Goodie Bag die. 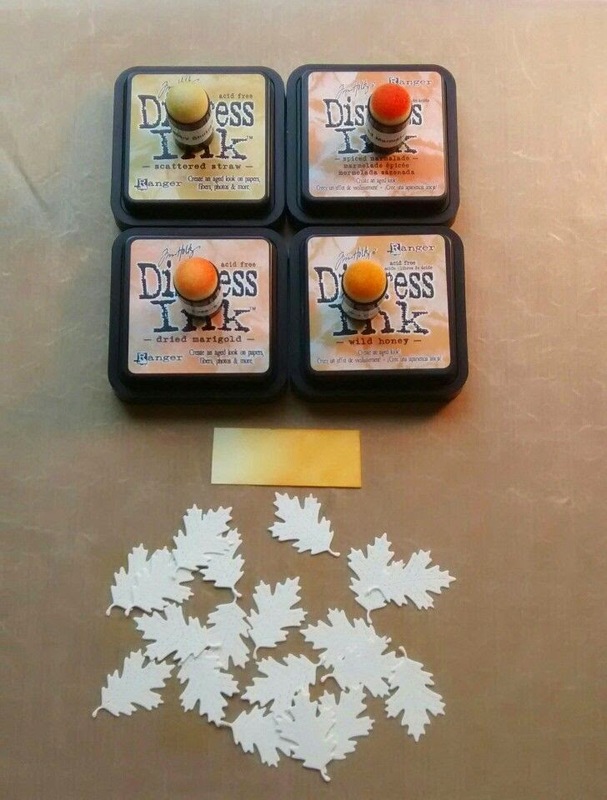 And before assembling them, I stamped them using Versamark ink and a leaf themed stamp set to create a background. I die cut the little banner from Vanilla card stock, lightly sponged the edges then added my sentiment using Versamark and embossing powder. I used Early Espresso from Stampin' Up! and Liquid Platinum from Ranger. LOVE the Liquid Platinum color! Next, I die cut the stitched leaves, and using sponge daubers and Distress Ink, I added layers of color until I achieved my desired results. In this picture here, you can see that I tested four colors of inks. But, I ended up using SIX! I sprayed the leaves with my homemade shimmer spray and while they were still a little damp, I manipulated them a bit, to coax them to curl, to add dimension. They are adhered to the greeting banner with foam tape. I decided to fill the bags with treats. And I remembered that every year, Angie Juda from Chic n' Scratch blog makes cute boxes and fills them with a Blessing Mix. A quick Google search resulted in finding a plethora of blessing mix recipes. I selected one and formatted it in Microsoft Word to where I could fit several on a page for easy printing. I also made it a size that could be die cut with a square Nestie. Hey, I needed to make twenty plus of these bags and I was looking for short cuts! After I printed them out, I die cut and dry embossed them and lightly sponged the edges. I adhered them down flat on the back of the bags. 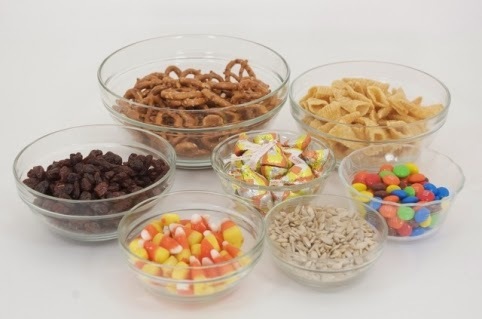 Here is a generic photo of the ingredients. For my bags, I used the Fall mix of M&M's and the Fall wrapped Hershey's Kisses. And instead of sunflower seeds, I used peanuts. If you do a Google search for this, you will find many more ways of putting it together. I saw one that used sunflower seeds still in the shell. I thought that was a really good idea, too. Here is the version of the Blessings Mix that I used. Again, there are many others online. Candy Corn: Sacrifice of the Pilgrims’ first winter, settlers survived on a few kernels of corn a day. Nuts or Seeds: Promise of a future harvest, reaped only if seeds are tended with diligence. M&M’s: Memories of those who came before us to guide us to a blessed future. Hershey’s Kiss: The love of family and friends that sweetens our lives. 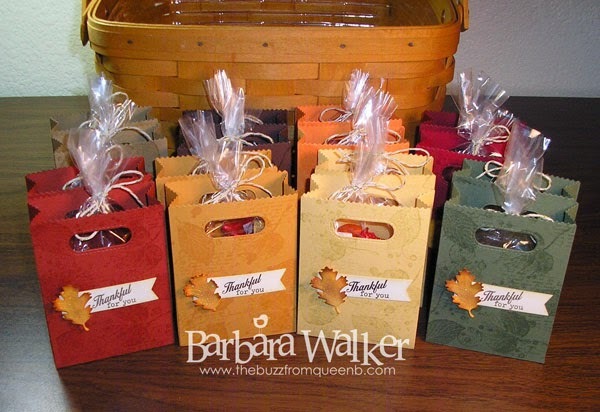 I used the 4 x 6 cellophane bags from Stampin' Up! for my treats and I tied them off with Gold Sparkle Hemp Cord from Lawn Fawn. And that was that! Thank you for visiting me today. I appreciate the visit. Have a wonderful week. 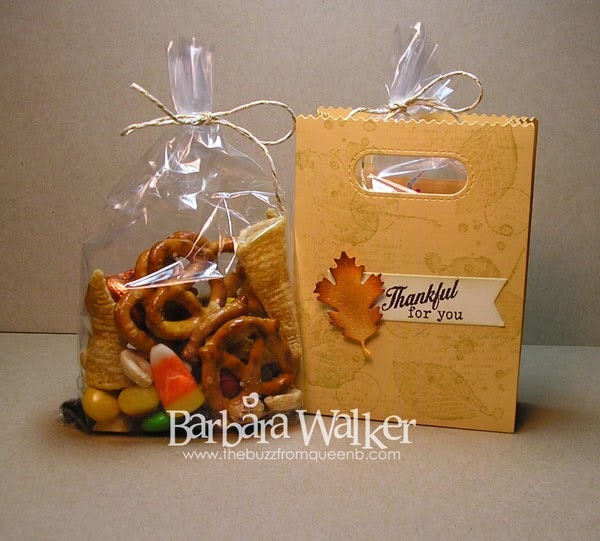 This is a fabulous project, Barb! You've created some beautiful bags with your stamping and misting and embossing. I really like the Blessings Mix idea. I will have to remember that! I'm sure the recipients will be thrilled with your thoughtfulness.Thank you so much for sharing.